A high performance package available for Buick models including Riviera, Skylark and Wildcat was the Buick Gran Sport or Buick GS. Buick was one of the last manufacturers to enter the muscle cars battle. It started, like other GM intermediate cars, as an option on an existing model. Once the car underwent fine tuning, it would become one of the most formidable and fearsome muscle cars of all time. In 1965 came the Skylark Gran Sport, an intermediate Buick GS with the GS option added. The GS had the largest engine supported by GM, a 400 cid Buick V8. This was known as the “nail head” engine due to the size of its valves and was capable of producing 32b5hp. More than 15,000 Skylarks equipped with the GS option were sold that year. The year after that, the Buick Skylark GS was redesigned and the performance was improved. New rear slooping panels were installed that were distinguished by blacked out grilles. Other additions were non-functional rear-facing hood scopes and front fender vents. The engine was now capable of producing 340bhp. The engine could accelerate to 60mph in just eight second. Only 13,000 units were produced despite the improvements made to the Buick GS. In 1967, a new 400 cid engine was introduced, the name was also changed to GS 400.The engine had a modern design, higher revving, an improved air cleaner and was generally ran better than the old engine. The major design change was the hood scoops were now facing forward. Along with the redesign of the engine and the exterior, the 3 speed automatic transmission was also included. A junior Buick GS muscle car was also formed that year, the GS 340 but was overshadowed by its brother, the GS 400. In 1968, the Buick GS was now a little over 4 inches shorter in length. 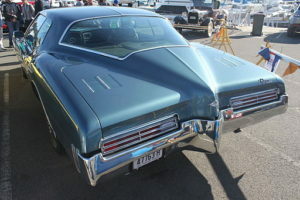 The rear end styling was changed along with the sail creases on the sides which resulted in the increase in overall weight of the Buick. A rare dealer installed option was introduced which enabled 11:0:1 compression, an improved transmission and stronger valve springs. 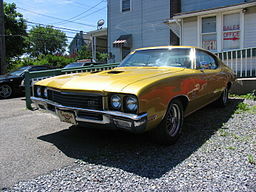 The Buick GS production ended in 1972 until it surface again in the mid 1980s. In most cases you can find these vehicles up for sale at police auctions, as they are generally used by undercover cops, and this is exactly where I found mine several years ago.